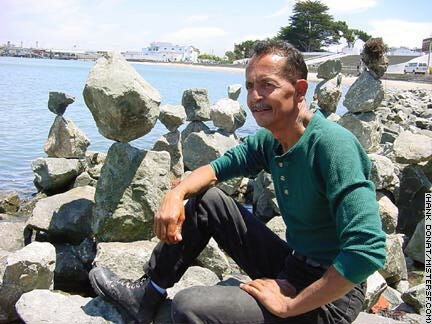 The name of Ron Divino comes up frequently whenever rock balancing is discussed in the SF Bay Area. His individual blend of deep spirituality and sincere friendliness is exemplified by his comment on MrSF.com that, "No matter what's going on, Mother Nature provides us with this beautiful world"; a beauty he contributed to with his playful and exuberant art, and with his optimism despite personal misfortune. His continued commitment to faith and balance after a stroke are shown on the One Hand Balancing page of this site. Born in Crotone, in Calabria, Italy, near where naturally balanced stones once existed, Mario Carnè has a young son, Simon, who has already begun to balance at his side. Mario himself has been balancing for almost 10 years, beginning with "two round, smooth stones from the mountains," he writes. And, in that moment, he "felt so relaxed" that his "difficulties in life were for a moment put aside". He is featured on the Generazioni-Generations page on this site. 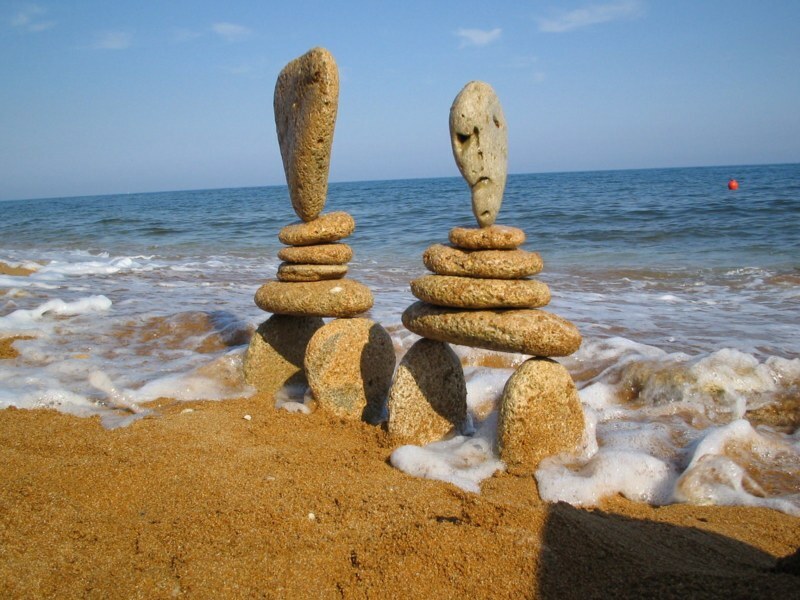 As a cultural "meme", balancing and stacking rocks has expanded enormously since the beginning of the millenium. The additional pages on this site which are linked below are just a sampling of the many practitioners around the world and their disciplined, dedicated, inspired works. BALANCING AT BURNING MAN - "Burners" get their rocks on in the Nevada desert. ELEMENTAL BALANCING - Chris Booth finds inspiration from Maori traditions. ENVIRONMENTAL BALANCING - Peter Riedel explores a variety of structures on the Toronto waterfront. INFRA-RED BALANCING - Anne Cutler uses the Northern California coast as backdrop for her stunning photos. 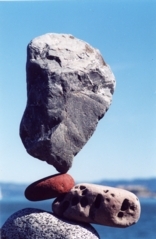 POCKET ROCK BALANCING - Dave Gorman from the UK moves the practice to the small end. PURE BALANCING - Ilia Barannikov and Remi Niezabitowski find art in the rubble of New York. STABLE BALANCING AND STACKING - John Félice Ceprano is a legend amongst his Canadian compatriots. 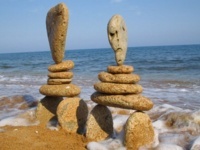 "UN-BALANCING" - Danny K. Brown of Colorado creates with time as well as balance and produces spectacular results. UPALA (STONE) YOGA - Shane Hart joins the rocks of Washington in their devotions. ZACHARY PINE, MD - Zach combines environmental art, healing, play, and social engagement.